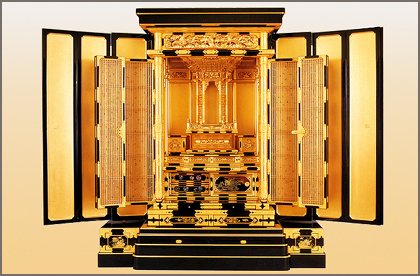 is a tabernacle found in religious temples and homes of Japanese and other Buddhist cultures. 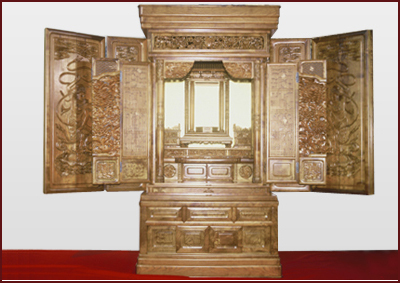 A butsudan is a wooden cabinet with doors that enclose and protect a religious icon, typically a statue or a mandala scroll. The doors are opened to display the icon during religious observances. A butsudan usually contains subsidiary religious items called "butsugu," such as candlesticks, incense burners, bells, and platforms for placing offerings. Some buddhist sects place "ihai", memorial tablets for deceased relatives, within or near the butsudan. An altar or tabernacle in the form of a podium, table, recess or cabinet used in the sanctuaries of temples and in private residences for the installation of Buddhist images and ancestral tablets, ihai 位牌, recording the posthumous names of deceased family members. The custom of setting Buddhist images upon podia was introduced to Japan along with the religion itself, and examples made from stone, tamped earth, clay, and timber are known. With increasing use of a raised timber floor in temples from the Heian period, timber podia--often built-in, lacquered and elaborately decorated--became the norm. 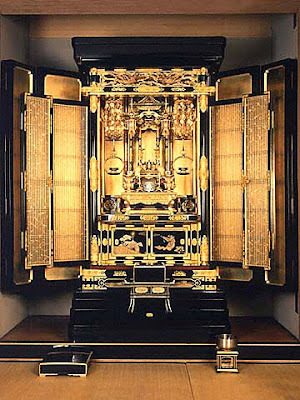 The use of a cabinet *zushi 厨子, to house images (statues, paintings, and mandalas) placed upon the podium also goes back to the early days of Buddhism in Japan. The provision of a butsudan in private residences began amongst the highest aristocracy at an early date and spread widely among the upper classes during the Kamakura and Muromachi periods, along with the provision of private chapels *jibutsudou 持仏堂. The practice of placing ancestral tablets in the butsudan is believed to derive from the influence of Confucianism, jukyou 儒教. By the Edo period, the principal purpose of the domestic butsudan was to provide a place to make offerings to the spirits of dead parents and ancestors. Only those who had inherited the parental house and carried on the main line possessed a butsudan. Thus a main house, honke 本家, possessed a butsudan, but a first generation branch house, bunke 分家, did not. It is not known when the butsudan spread to vernacular houses *minka 民家, although it can be inferred from the presence of a private chapel on the plan of the 1397 Rin'ami 琳阿弥house, that some kind of butsudan was in use in the most sophisticated vernacular houses by the end of the 14c. Among early surviving vernacular houses of the 17c, a number originally had no permanent butsudan, so it is probable that a portable table was set up when necessary for rituals. However, with the exception of some areas such as Kagoshima, the butsudan had become an almost universal fixture of vernacular houses by the end of the Edo period. Amongst the upper classes, the butsudan might take the form of a platform representing Mt. Sumeru *shumidan 須弥壇, an example being that of Jishouji *Tougudou 慈照寺東求堂 (1486) in Kyoto, in Ashikaga Yoshimasa's 足利義政 Higashiyama 東山 residence. An area known as the *butsuma 仏間 inside the Tougudou also contained a recess, closed with sliding screens *fusuma 襖, with a shelf which is believed to have been intended for the installation of ancestral tablets, an arrangement foreshadowing the butsudan as it appears in Edo period vernacular houses. The butsudan in Edo period vernacular houses may be divided into 6 basic types as follows. 1　A butsudan built into a recess, equipped with sliding doors and a small podium inside on which to stand the ancestral tablets. This type is to be found in the highest-ranking vernacular houses of the early 17c in the Kinki 近畿 region. By the mid-17c these had become decorative, and above them was placed a transom *ranma 欄間, with openwork *sukashibori 透彫, and an inner cabinet with its own doors and a base resembling a miniature shumidan. 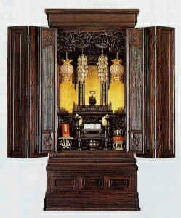 2　A recess similar to a decorative alcove *tokonoma 床の間, within which a freestanding lacquered cabinet was placed. Originally open, it tended to acquire doors at the front. This type is particularly associated with the New Pure Land sect, Joudo shinshuu 浄土真宗, but was not confined to that sect. 3　Similar to 2, but the *tokogamachi 床框 was higher--about 30cm above the floor--and the recess too shallow for a cabinet so it is probable and the ancestral tablets were placed upon the shelf directly. Originally it had no doors, but it tended to acquire them. 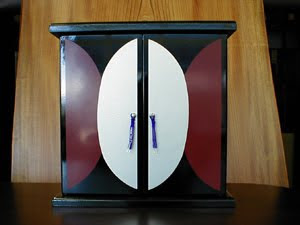 4　Cupboard, todana 戸棚, type, the lower part containing a storage cupboard with sliding doors and the upper part the butsudan. The butsudan section may have 4 sliding doors, hikichigaido 引違戸 (see *hikichigai 引違), or a pair of double-folding swing doors *kannonbiraki tobira 観音開扉. This type may be a freestanding piece of furniture or it may be built in. Over time there was a tendency to raise the height of the sill track *shikii 敷居, dividing lower cupboard section from the butsudan, which is believed to reflect a change in seating styles from sitting cross-legged, agura あぐら, to sitting up straight on folded legs, seiza 正座. 5　Also a cupboard type, but set in a high position, usually with storage cupboards below. See *fukurodana 袋棚. 6　The butsudan is placed within a small enclosed room and observers pay their respects from an outer room, an arrangement that may reflect the influence of the sanctuary *naijin 内陣, and worship hall *gejin 外陣, of temple architecture characteristic of Esoteric Buddhism, mikkyou 密教. Sometimes a special room *butsudan-no-ma 仏壇の間 or butsudanma 仏壇間, is provided for the butsudan, but in other cases it may be located in the main reception room *dei 出居; *zashiki 座敷; or grand room *hiroma 広間 of a vernacular house of the *hiromagata 広間型 format. According to the various Buddhist sect, the main deity (honzon, go honzon 本尊　ご本尊) celebrated at the altar is different. For the Zen sect, it is Shakyamuni, the Buddha, in the center and Bodhidaruma on the right side. On the left is the founder of the sect. Many are in a small box format for the modern apartment dwellers with little space. CLICK image for more photos ! They are the most elaborate and expensive ones, more than 700.0000 Yen. It takes more than half a year to finish one. Kyoto, the center of Imperial Court culture, is also the center of Buddhist culture. Temples, large and small, of many Buddhist denominations are located throughout the city. It was while meeting the demand from these numerous temples and also from households that Kyoto's Butsudan (called Kyo-Butsudan) and Butsugu (Kyo-Butsugu) developed. A Buddha-altar isn’t only a place to honor one’s ancestors. Within the altar, there is an area where Mt. Sumeru (the mountain at the center of the Buddhist cosmology) is represented and in the center of that area the main image is enshrined. In the same way as a temple’s main Dharma Hall, the Buddha-altar is “the temple in the middle of the home". The three fundamentals of Soto Zen School practice and faith are sitting, gassho, and worship. It is by sitting with a quiet mind, with our hands held together in gassho, and worshipping (expressing our reverence) that we are able to reflect on our everyday lives and practice the teaching of Buddha. Fulfilling this practice brings us peace of mind. To honor our ancestors is to repay our sense of gratitude for having received life from them. This is also to keenly feel that we have inherited not only our individual lives but the life of all things.
. Kagoshima Folk Art - 鹿児島県　. In the middle of the Kamakura period, family Buddhist altars became popular. They are called 仏壇 (butsudan) in Japanese. Early in the nineteenth century, these Buddhist altars the industry of making these altars started and became popular later. Today, it has become the base of Kawanabe Buddhist altar industry. Now there are many shops which sell Kawanabe Buddhist altars in Kawanabe.
. Tokyo and Edo Folk Art 東京　江戸 . 01 -- The basic wooden construction of Tokyo Butsudan (Buddhist Altars) is assembled free of nails. Woodworking techniques such as mitered shoulder joints, dovetail keyed miter joints, and mortise and tenon joints are all used. 02 -- Engraving involves standard woodworking techniques, as well as the working of reliefs and inlays, etc. 03 -- Using lacquer that has undergone a refining process, the finish that is applied is polished to a gloss. Timber species used in the construction of Butsudan include Ebony, Rosewood, Bombay Blackwood, Chinese Quince, Zelkova, Mulberry, Cherry, Cypress, Cedar and other timbers with similar qualities. Additionally, a natural lacquer is used for lacquering. 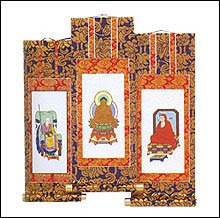 In modern times, when Butsudan (Buddhist Altars) are imagined by people, they tend to think of immobile box-type structures that are placed somewhere. However, when originally conceptualized, Butsudan were seen as a stand on which statues of Buddha could be safely placed within the precincts of Buddhist temples. As the meaning of "Butsudan" when written in kanji characters implies (literally "a platform on which a statue of Buddha maybe safely placed"), at one stage such altars were also created from earth and stone in addition to wood. Concerning the use of stone structures, it seems that their origins lay in cave altars constructed in India and China. Buddhism reached Japan in 538 (552 in some sources) during the Asuka Period. This was due to King Seong of the Kingdom of Baekje offering a Buddhist statue and sutra scrolls as a gift. 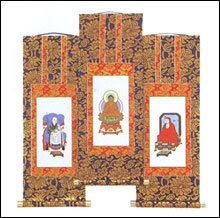 The Emperor Tenmu stated in 685, “Iurge that within the country, each household be encouraged to build an altar with a dais where an image of Buddha and a sutra may be placed; and that each does hereby engage in acts of worship.” This rescript is said to have resulted in the construction of Buddhist monasteries and nunneries in each province of the country during the Nara Period that followed. until the Heian Period (794 - 1185) Buddhism remained a preserve of the aristocracy, during the Kamakura Period (1185-1333) it underwent a transformation as the aristocracy conveyed it to the warrior classes. Furthermore, through the work of missionaries such as Honen, Shinran and Nichiren, Buddhism spread further among the masses. the arrival of the Tokugawa Shogunate (1603 - 1868), because a system of government with the Shogunate at its apex was established, an attitude that promoted both the protection and strengthening of Buddhism was instituted. Such policies saw numerous temples being built in Edo as the power of Buddhism increased due to the organization of death registers. started to be manufactured at the beginning of the Genroku Era (1688 - 1704). Using their own techniques and materials such as hardwood timbers including Mulberry and Zelkova, during their work breaks the cabinetmakers of Edo made rather simple cabinets without much decoration. Furthermore, it is also said that Shokei Yasuda, a third-generation Edo sculptor of Buddhist statues, was the first person to use imported timbers such as Ebony and Rosewood (in around 1840). the Tokyo Butsudan craft continues to incorporate the skills passed down by generations of craftsmen. The altars themselves also offer a marvelous sense of splendor that induces those who witness them to bow in reverence.
. Yamagata Folk Art - 山形県　. By the middle of the Edo period (1600-1868), the number of people travelling to and from Kyoto had increased because of the trade in such crops as safflower from Yamagata. As a result, Buddhist altar culture found its way into the area. Some craftsmen went to distant Edo (Tokyo) to learn carving skills and began working on such things as transoms and other articles related to Buddhism. Subsequently, workers of metal, lacquerers and maki-e decorators began to make household Buddhist altars. Facings are of zelkova (Zelkova serrata) or sen (Kalopanax septemlobus) which are lacquered to bring out their grain and to give them a warmth. The kuden or inner sanctuary with its bracket assemblies has a heart-warming beauty. The fittings, which are inlaid with arabesque patterns on black, are grand within a composed setting, and the carvings of dragons and heavenly beings have a glittering splendor. There are now 115 firms employing 262 staff, among which there are 22 government recognized Master Craftsmen. Of the butsudan and shrines. lit. this is a door that opens to both sides of a cupboard, displaying the cupboard interior in the middle. This is in contrast to the sliding doors which are usual in a Japanese home. The Buddha Shelf for the Ancestors (butsudan) in a home opens like this too, and usually shows the statue of a little Kannon Bosatsu, hence the name.
. kamidana 神棚　household Shinto altar, "shelf for the Gods" .
. butsudan　仏壇と伝説 legends about the Buddhist family altar .
. Japanese Architecture 日本建築 - Introduction .